But it is real, not computer generated. 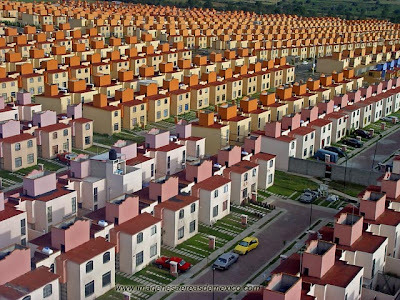 It is “low-income housing in Ixtapaluca, Mexico City.” (Again, via BLDGBLOG). Can we learn to love the same? We have never tried. Our aesthetic, far outrun by our politics, was and has remained that of the autonomous individual, forever damned to assert her or his autonomous individuality, her idiosyncrasy, his exhausted maintenance of difference. But perhaps in a world of true efficiency, an efficiency aimed at equality rather than one in service of exploitation, we will need to learn to love the same. The study of art, all forms of art, has lost track of the aesthetic, the question of it, the putting of it up for question. It is not that a sense of form has deserted us, but rather that we have abandoned the hard questions of purpose and priority. We have bracketed off the aesthetic as compromised, rather than compromised ourselves in the development of a new one. Barthes had his answer to this hysteria-less silence, an answer in a certain sense determinative or at least highly reflective of the sweep of critical thought over the the next thirty years. Perhaps it is time to rethink this answer. I just stumbled upon this blog by accident, and while I’m sure I don’t understand most of what you write about, I’ve read a lot of your articles and this one seems to speak to me most. It’s disturbing because this morning on the bus as I rode across the bridge and into the city, I had this train of thought that left me thinking along similar lines. Feeling initially that the larger our population gets, the more we all try and struggle to define ourselves as ‘different’. We struggle to be noticed and to stand out, but this simply increases the difficulty of doing so. More and more, I realised how frightening that was. I then thought about what the next part of our development as a species would be based on where we are now. Unified workers donning our shirts and coats, earning money which is in the end funelled back into the machine again, promoting more growth, a greater spread. I thought about species that are huge in number and how they act, and it all came down to the thought that like the bee working mindlessly in the hive, an ant in the colony, a fish in the school or a bird in the flock, we will eventually find no use in being different, as the way of life that we’ve built for ourselves has no use for difference. I’m terrified of the ramifications of this line of thinking.